It has been seven and a half long years since we last saw Faith in a console version of Mirror’s Edge. This game sharply divided gamers everywhere in 2008. You either loved the game’s parkour-inspired levels, and overlooked the weak story, or hated the game’s practically claustrophobic indoors sections, and of course everyone hated combat. EA also took their sweet time to confirm a sequel, and longer still to get us to this point. With a recent delay also pushing things back, we’re all just grateful that they have released a closed beta. We’ve taken this early look at the game for a spin, and have our impressions ready for you now. I’ll be honest and say that it has been too long since I last played Mirror’s Edge to remember everything that happened in the last game. Thankfully, this is a reboot, so you don’t have to worry about digging into your brain’s archives to try and remember who was who. You play as a younger Faith, one who is fresh out of prison and eager to get back into the Running business. You’re quickly introduced to a handful of characters, more than a few of which have references to biblical and Grecian characters. Noah is the leader of your clan, and appears to be somewhat of a father figure to Faith. Icarus is one of the newest Runners on the scene, and is a complete douche. With a name like that, though, I don’t think he’ll last particularly long. Since you’re a younger version of Faith, you have younger-person problems. You know, like owing money to a guy who’s known for using Mafia-type tactics to get his payment. He also has henchmen who pester you as soon as you get out of jail for payment. Just typical young-person problems, am I right? Not to worry, you’ll scrounge up enough Scrip (in-game currency) through the game’s missions in due time. Mirror’s Edge Catalyst is an open-world game, because it’s 2016 and of course this has to be a thing that’s made open-world. A lot has changed in the gaming landscape since the original burst onto the scene in 2008, and it appears that EA thought this game would have firmer legs to stand on if the game were presented in such a way. While the closed beta kept us locked to a certain area of the city, what could be explored was still a good couple of square kilometers/miles/pick-a-unit. There were chain link fences to hop over, air conditioning vents to slide under, roofs to squeak across, and ziplines to hang and gracefully fall from. While you were free to go wherever you wanted, Runner’s Vision was ever-present, always guiding you to your next objective by coloring key objects to jump over or grab onto in order to keep your momentum up. Combat is a necessary evil in most games, and thankfully it has actually been improved upon from the last run with Faith. I did not see an option to disarm an enemy and take their weapon – instead, it’s all about hitting hard and/or fast. If you’re in a hurry, you don’t have to take down all enemies all the time. Simply pressing square as you run up to them will get them out of your way, hardly breaking your stride as you escape their grasp. On the other hand, leaping from a rooftop and pressing triangle at the correct time will initiate a drop-kick, and most guards will be lights-out at that point. If you find yourself cornered, you can slam one Kruger-Sec guard into another (awesome! ), toss one over some railing, or even disrupt their communications helmets briefly, once you upgrade your abilities. Did I say upgrade abilities? Yes, as with any other open-world game, Mirror’s Edge Catalyst features a three-pronged upgrade system. You collect XP, and level up every few missions or so. Upgrades are available in three categories: running, combat, and gear. Thankfully, most of the running-related abilities are unlocked at the start. While quickturn and roll-landing is not available immediately, those abilities are available for unlocking after you’ve completed just a few missions. There is no indication that the initial loadout is exclusive to the closed beta, so hopefully this means we all start the full game with Faith relatively accustomed to life as a Runner, with most running abilities unlocked. Combat abilities involve extra fighting moves, and have nothing to do with you picking up a gun at any point. The Frostbite 3 engine looks better than ever, and this game looks stunning and plays pretty smoothly. I noticed some stuttering during cutscenes, but those should hopefully be ironed out between now and release. Gameplay was sleek, and when jumping, ducking, sliding and drop-kicking in sequence, everything simply flowed together. The city of Glass is usually seen from up above, and it looks alive and thriving, with tons of traffic, the ever-present glow of video advertisements, and drones aplenty. I’m not sure of the frame rate or display resolution that this beta was running, but it doesn’t really matter. Catalyst looks, feels, sounds, and acts just like a Mirror’s Edge game. Beyond the handful or so story missions we were able to play during this closed beta, there were also time trials to try, both built-in and user-generated. Creating a time trial is a fairly easy process, but of course can be avoided entirely if you don’t want to mess with any of that. It’ll be interesting to see the crazy routes that some of the game’s best players can come up with given enough time with the game. There are leaderboards for each of these trials as well, to push those competitive gamers to their limit as they try to shave off hundredths of a second to claim the top spot. If you absolutely hate the idea of an open-world Mirror’s Edge game, hear me out. It’s only as open-world as you make it. The game automatically sets a waypoint to the next story mission, so you can avoid almost all of the unnecessary side missions except for those first few you are forced to run through as a part of the game’s extended tutorial. The rest of us, though, await with bated breath Faith’s next adventure. 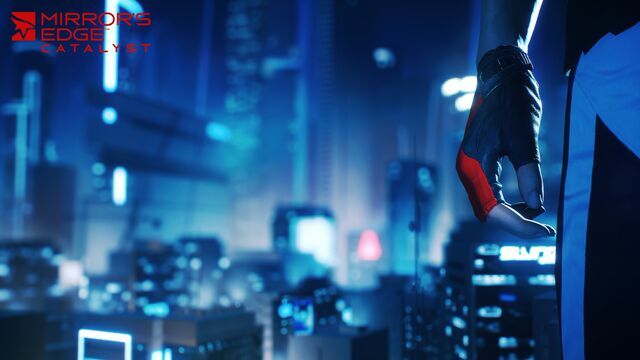 Be sure to come right back to PlayStation LifeStyle for nonstop coverage of Mirror’s Edge Catalyst.